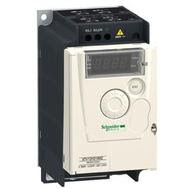 Schneider Electric Altivar 12 Nano AC Drives is a very popular AC drive which is flexible, reliable and comes with advanced sensorless flux vector technology and find application in HVAC, packaging, food & beverage industries. NanoATV12 comes with 4 logic inputs, 1 analog input, 1 status relay, 1 digital output, 1 analog output and Modbus Communications for control and monitoring. This user manual will help you in mounting, wiring, programming and troubleshooting the Altivar 12 Nano AC drives. Subscribe to Automation-Talk by Email.